Perfect for rental use for ski resorts and snowtubing hills, ski area surface lifts, or high use snow tubing. 40 ounce vinyl, acrylic coated lick bottom offers superior puncture resistance. 5' removable, replaceable heavy webbing hand tow leash included. 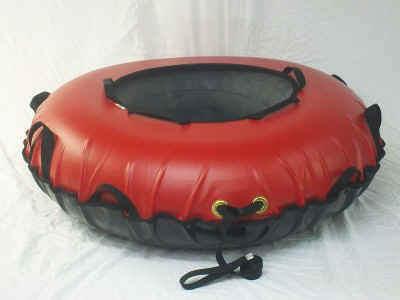 20" (Inner Diameter) recreational rubber inner tube is included. 18.5 oz rip stop vinyl tops in assorted colors. (2) # 6 brass grommets secure the heavy duty removable/replaceable hand tow leash. Note: hand tow while empty only. 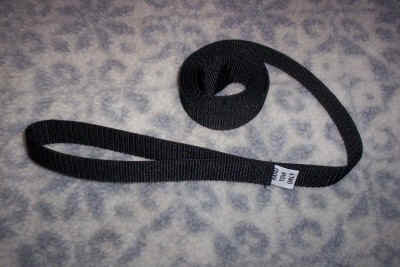 (2) 1" x 9" heavy nylon belly handles located in the front seams for easy laydown snowtubing. (4) 1" handles in the inner bind allow children easy access to multiple grab points. 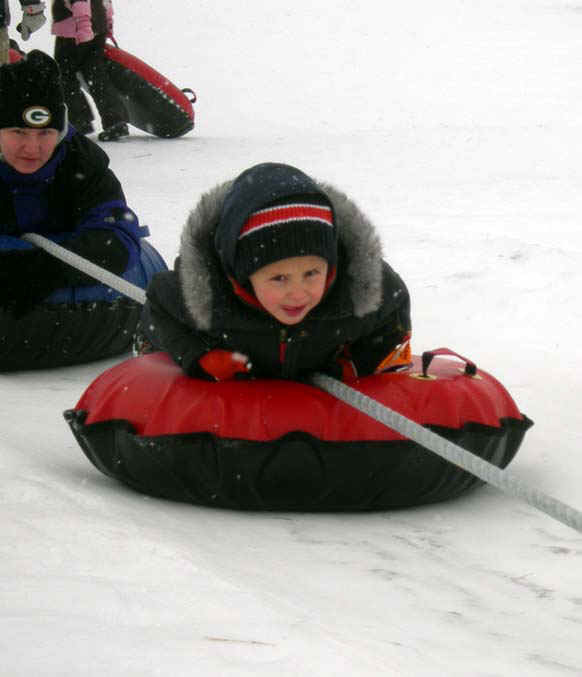 (6) 1.5" heavy webbing handles circle the entire snowtube for easy reach for riders of all sizes. Double needle sewn 2" heavy poly web binding on cover opening. 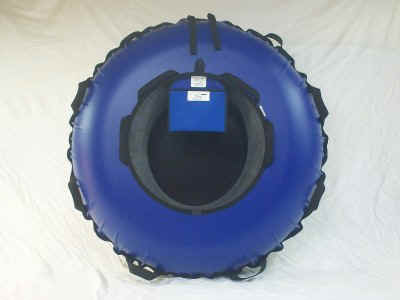 44" commercial snowtube rider weight limit: 300 lbs. 44" Commercial Tubes $85.00, 2 = $84.00 ea. 3 +$83.00 ea. Option: Ski Area surface lift loading ring available at extra cost - see the description below. Extend the life of your snow tube bottom from boots, sharp objects falling from clothing, and other debris. The padded floor fits perfect, and protects the entire inside bottom. It is made of a Cordura Nylon top, ½" of foam, and a white slick 20 oz waterproof bottom. Comes with 2 handles to easily install or remove. Padded floor can also double as a 2 handle sled with the slick bottom. Handy in the off season for gardening or kneeling. 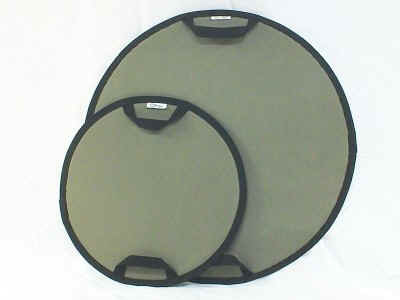 Padded snow tube floor for our 32" toddler tubes, floor is 18" wide, dark green, $15.00 ea. Padded snow tube floor for all of our 44" adult snow tubes, floor is 26" wide, dark green, $19.95 ea. Designed for toddlers 6 years old or younger, and 60 pounds or less. Features the same heavy duty 18.5 oz Vinyl top with grommeted handles as our adult Commercial tubes, just in a smaller size. This 2012 model comes with 8 Handles, 2 of them in the front for lay down snow tubing. 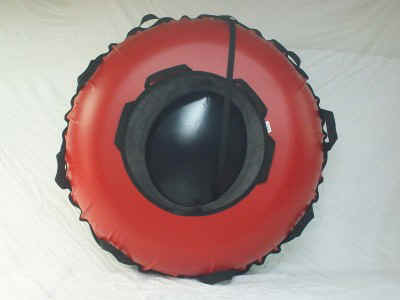 Comes complete with a 16" ID rubber inner tube, hand tow leash, and features our heavy duty 40 oz black vinyl commercial use Acrylic Gloss bottom. Specs: 32" wide, 9" Tall, 18" wide opening. 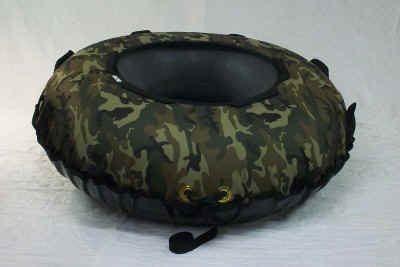 Weight: 6 pounds with Snowtube cover, 16" ID rubber inner tube, and hand tow leash. 32" Toddler snowtube rider weight limit: 60 lbs. Colors: See current inventory on the main page. Price $69.95 ea. 2 $68.00 ea. 3 +$67.00 ea. 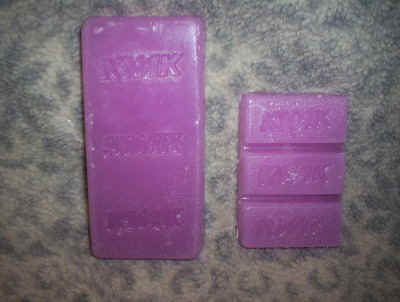 1 ea Kwik 250 gram family Wax bar. Price $45.00 ea. You save $6.95 over buying items separately. 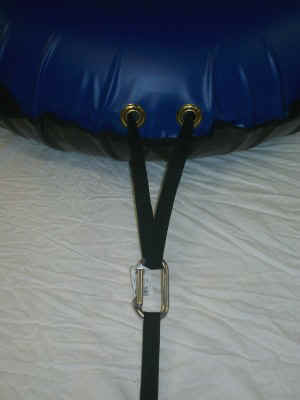 Internal harness system made of heavyweight 1 " poly webbing goes around the entire circumference of the snowtube. This allows all the pull to be on the entire snowtube and not just on one point of the cover. Tow Loops on the front harness for a carabiner or snaplink. 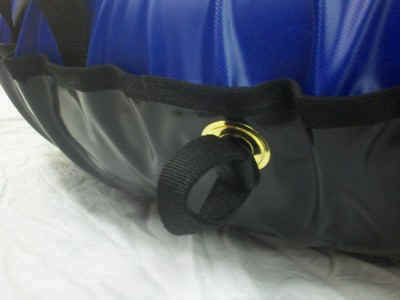 Internal harness is free floating through sewn in loops, and can be replaced and removed. 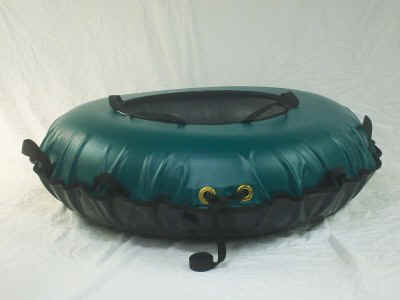 44" Towable snowtube rider weight limit: 300 lbs. 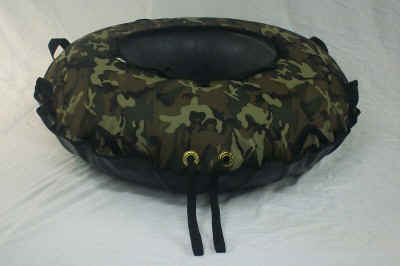 Specs: 18.5 Oz Vinyl Coated polyester top, two heavyweight nylon webbing handles through brass grommets, two 1" x 9" belly handles in the front seams for lay down tubing. 40 oz Heavy duty commercial grade slick bottom. Weight-13 pounds with rubber tube. 44" Towable Tube rear shot with "Trailer hitch" option. (add $13.00 = $132.95 ea.) 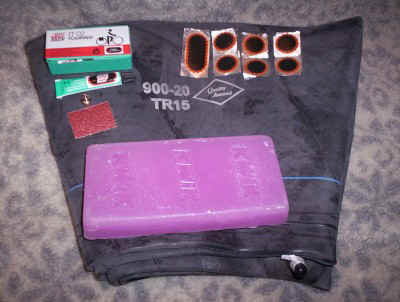 Package includes, 20" ID rubber inner tube, Towable cover with inside pocket for Snowtube wax, and inner tube repair kit (sold separately). The inside pocket also has printed guidelines for rider capacity, max speed, max weight, and snowtube filling instructions. Hand tow leash, and Internal tow leash are included. These are made in Washington State, USA. Shipping by UPS ground to the lower 48 or priority mail to Alaska and Hawaii. We ship this item worldwide if you wish. $99.95 ea, 2 = $98.00 ea, 3 + $97.00 ea. 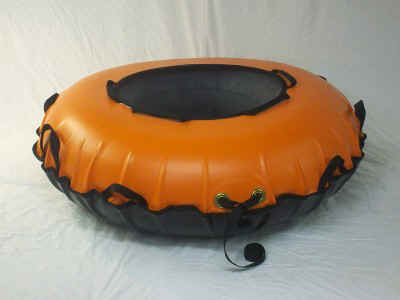 Our new 54” Towable snow tube for larger riders. Same specs as our 44” Towable snow tube, but a larger version for riders over 200 lbs. This 54” towable tube has a built in trailer hitch in the rear, for pulling a second towable tube behind it. Measures 54” wide by 14.5” tall when inflated. Includes a very heavy duty backhoe inner tube with a TR-21 quick deflate air valve. This package includes a 54” Commercial towable cover, heavy backhoe rubber inner tube, hand tow leash, heavier internal tow leash, a pocket wax, carabiner and rubber inner tube repair kit. Features 11 handles, center loop for carabiner storage when not in towing mode, and our 40 Ounce slick gloss bottom. Package weight 17 pounds. Shipping weight 19 pounds LIMITED QUANTITY, Available in Blue or RED. Ideal for clipping in your Towable snowtube internal leash to your towing line!. Replacement and extra rubber inner tubes. All are brand new with TR-13 and TR-15 Valves. 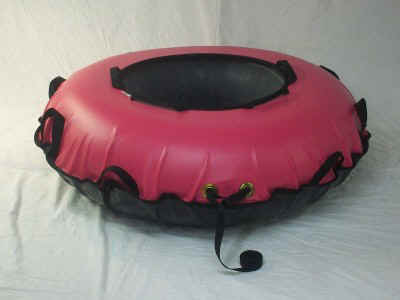 16" ID rubber tube for 32" toddler snowtube $20.00 ea. 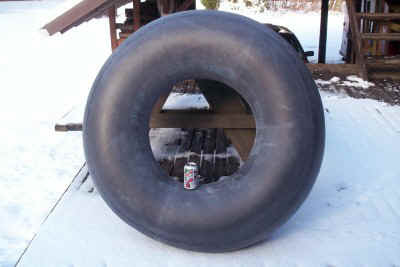 20" ID rubber tube for 44" snowtubes $29.95 ea., 4+ $29.00 ea., 7+ $28.00 ea. Kwik Violet Snowtube Wax 14°-32° 250 gram Family size on left and 100 gram Pocket size on the right KWIK- "Violet" - Snowtube bottom Wax Bar. Now available in the large 250 (8.5 oz.) gram "Family" size, and the "Pocket" 100 gram (3.5 oz), the Violet bar wax from Kwik is perfect for hand rubbing the 30" x 30" running surfaces of our 44" Recreational, Commercial, and Transport snowtube vinyl bottoms. No waxing iron needed, just rub on in a warm room and you are ready for the snow. The wide temperature rating of 14°-32° is well suited for our east coast customers. Gives life & speed back to your snowtube bottom. $12.00 ea, 3+ $11.00 ea, 6+ $10.00 ea. A must have for your rubber inner tube maintenance, and fast, easy deflation of your tube when you are done on the slopes for the day. 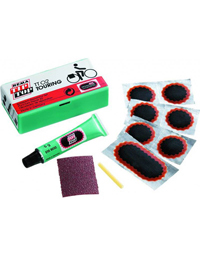 Includes Compact, rubber inner tube repair kit with 7 patches, adhesive and compact valve core remover/cap. Valve core remover can screw onto the air valve when NOT IN USE to prevent loss. NOT ADVISED TO HAVE VALVE CORE REMOVER SCREWED ON WHILE SNOWTUBE IS IN USE. IT HAS SHARP POINTS. 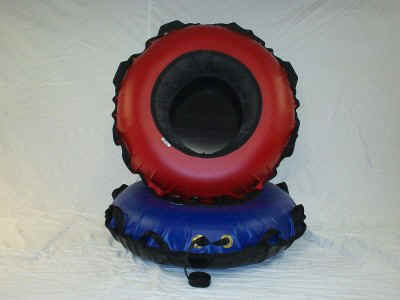 This item Available ONLY when ordering a Snowtube or replacement rubber tubes. STOCK # 124473 $4.95 ea. Complete Accessory Kit 44" or 32" Complete Accessory Kit 44"
1 ea Kwik Family size Wax bar. Accepted for phone, fax orders and the order form. 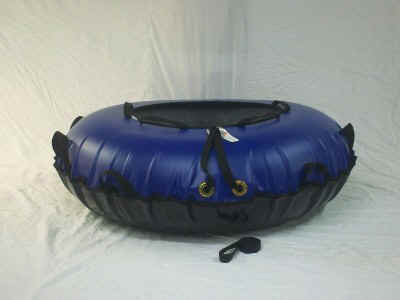 We accept online payment through the Secure Snowtube order form, and PayPal.